The center was founded in 2000. 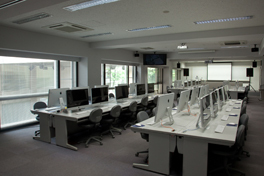 One of the shared facilities of the campus, it provides information technology support to all members of the university. The center runs an art media system. In addition to this it provides the campus network service, promotes information-oriented education and research, and facilitates application of computer technology in administrative affairs. The center consists of a laboratory, a computer training room, a computer atelier, a computer lounge, a network management room and a machine room.